Lakers center Roy Hibbert sat out practice Monday, visiting with team doctors because of a sore right knee. "He just said he tweaked it a little bit," Coach Byron Scott said. "We didn't do X-rays or [an] MRI; he says he feels fine, just a little swelling in there. We'll see how he feels tomorrow." According to the team's game notes, Hibbert is questionable for Tuesday night's exhibition game against the Sacramento Kings in Las Vegas. "He just said to me about five minutes ago that he'll be ready to go tomorrow. So we'll see," Scott said. The Los Angeles Lakers practiced Monday morning before hopping on a plane to Las Vegas for their next preseason game on Tuesday night against the Sacramento Kings. Lakers head coach Byron Scott anticipates having the same starting lineup as Sunday night of Kobe Bryant, Jordan Clarkson, Julius Randle, Anthony Brown and Roy Hibbert. However, Hibbert is currently listed as probable for tomorrow night’s game with a sore right knee. Though Russell is also officially listed as probable (bruised glute), he will likely be available for tomorrow’s game, but will come off the bench. Russell had 11 assists in his 18 minutes off the bench last night, with just two turnovers, another solid performance. A lot of talk has been made about Russell’s ability to see when his teammates are open before the players themselves know they are open, and even though this will likely lead to turnovers early on, Scott wants Russell to have that freedom to make those risky passes. I hope he rests. Roy is the most irreplaceable. It also gives a chance to see more of Upshaw, Sacre and Black. D'Angelo Russell returned after suffering something so minor he didn't want to call it an injury during his postgame availability, and he put on a passing clinic against the overmatched Maccabi Haifa to prove he's just fine. D'Angelo ended the night with 11 assists in 18 minutes, hitting his teammates with the kind of natural feel that is startling for a player as young as he is. "If you're open, I'm going to get it to you. Half the time, you won't know you're open," Russell told media following his double-digit dime outing. Those passes coming out of nowhere are the ones that make make highlights and set him apart as an otherworldly talent. What the Los Angeles Lakers are doing around him on offense when things slow down to halfcourt sets has also been impressive though, quietly complements him well. The last game was the most I've seen this team move off the ball. Summer League was just a clusterF. Russell has done a fine job finding guys coming off screens, and I like how he himself moves after passing the ball. Randle could learn a few things from Russell about moving without the ball. I really hope that off-ball movement continues. It would really vindicate Byron after all the hate he gets for having an "old school" system. How will D’Angelo Russell match up with NBA’s elite point guards? Only a night after dazzling his teammates with his pinpoint passes, Lakers rookie point guard D’Angelo Russell spent the end of Monday’s practice helping his team with something that involved a little less fanfare. Russell lingered around to pick up all the empty water bottles as part of his rookie duties. Russell could soon experience something just as humbling. The Lakers (1-3) will play the Sacramento Kings (3-1) on Tuesday in Las Vegas, where Russell will match up against nine-year NBA veteran Rajon Rondo. Russell will face other star point guards on Saturday (Golden State’s Stephen Curry) and on Monday (Portland’s Damian Lillard). D’Angelo Russell has excelled in his early preseason appearances, and for good reason. In Russell’s debut, Utah didn’t exactly offer up a blockbuster point guard matchup with Trey Burke. His second game was against Israel’s Maccabi Haifa. Things are about to get significantly more challenging for the Lakers guard, who in the next three games will match up against Rajon Rondo, Stephen Curry and Damian Lillard. Those players represent something Russell intends to be very soon: the upper echelon of NBA playmakers. But the No. 2 draft pick is not dwelling too much on those individual matchups, focusing instead on one team against the other. Count Coach Byron Scott among those curious to see how Russell matches up with those players, starting with Tuesday’s game in Las Vegas against Rondo and the Sacramento Kings. “I want to see how he reacts to playing against some of the best,” Scott said. The first couple of matchups come with built-in story-lines. Last game was nice but it wasnt real. Sacramento will be the first real test for our rookies. The Los Angeles Lakers have four more preseason games to go before heading into the regular season on Oct. 28 against the Minnesota Timberwolves. The Lakers will face three more teams in four games with matchups against the Sacramento Kings, Golden State Warriors (twice) and Portland Trail Blazers in the coming weeks. Head coach Byron Scott and company will need to get the current roster down to 15 players before the start of the regular season. Four players will ultimately be cut over the next few weeks with a couple of those players likely being in the frontcourt. Although four preseason games remain for the Lakers, Coach Scott admitted on Sunday that roster cuts could start after the game against the Kings on Tuesday night at the MGM Grand Arena. “I would think we probably start cutting down then,” said Scott. This is a fantastic thread. I really appreciate it. Thank you LF! Last week, the Lakers wrapped their training-camp trip to Hawaii with an exhibition loss to the Utah Jazz. Rookie D'Angelo Russell gives the Lakers a scare with a fall but suffered just a bruised glute for his trouble. Forward Brandon Bass was also injured, bruising his knee. The NBA also suspended Utah's Trevor Boozer for striking center Roy Hibbert. Meanwhile, the Lakers were just happy to be finished with Coach Byron Scott's extensive running drills. The team returned to California, hosting the Toronto Raptors in Ontario for a third straight loss, although second-year forward Julius Randle continued to get "a lot of things right." After the loss, Kobe Bryant said he wants the Lakers to play better defense. Jordan Clarkson looked solid, working diligently to improve his play. The Lakers finally got a win, beating Israeli squad Maccabi Haifa convincingly at Staples Center. Anytime the Los Angeles Lakers acquire a center, the tendency is bring up the glorious history of those who played the position. Wilt followed Mikan; Kareem, Wilt; Shaq, Kareem; Dwight, Sh- .... never mind. Those players all felt immediate pressure because of their own prodigious talent and the circumstance in which they came to the Lakers. For whatever reason, though, Roy Hibbert did not have those expectations heaped upon him from the start, though his impact has been immediate. Hibbert is known for being huge, lumbering and special on defense. Thing is: he's leading with the small things. In a moment that stood out in the Lakers' first preseason game, Hibbert slid over as a Jazz player drove to the basket. Behind him, Jordan Clarkson didn't rotate down to help the helper and as a result, Hibbert's man scored on an and-one. Last year, Carlos Boozer might've just screamed "AND ONE" uselessly, and Clarkson wouldn't have been held immediately accountable. This year, with Roy around, the opposite was the case. Roy turned around and scolded Clarkson, telling the second-year guard where he needed to be at that moment. That kind of on-court accountability has been all but absent outside of Kobe Bryant's teachings. This interaction was front and center, and has happened at least a few times thus far. Words can be empty, but when it's Hibbert -- known most for his defensive technique and IQ -- those words mean just a little more. He's leading by example. The Los Angeles Lakers are coming off of their first win of the preseason, where they won by a sizable margin against Maccabi Haifa. The Lakers made their debut at Staples Center and did not fail to impress the home crowd, beating the team from Israel by a score of 126-83. The Lakers even led by 51 points at one junction of the game, but what was most impressive was the way they moved the ball on offense. D’Angelo Russell dazzled in his return from the injury to his glute, dishing out 11 assists in just 18 minutes. The Lakers will look to build upon this victory in Las Vegas, where they will take on the the Sacramento Kings at the MGM Grand Arena. Basketball fans admired Jerry West when he was in his 20s and 30s. First, he and Elgin Baylor were superstars who introduced the NBA to Los Angeles. Then in 1972 he and Wilt Chamberlain led Coach Bill Sharman's Lakers on a 33-game winning streak, which has never been equaled, and then the NBA championship. Finally, West became the Lakers' general manager and presided over six more championship years. He made the most spectacular front office decision in Laker history in 1996 by trading a solid NBA center, Vlade Divac, in order to draft high school phenom Kobe Bryant, then signed free agent Shaqille O'Neal. There was a gap of several weeks, which West described as the most trying of his life, But he had the courage to take a gamble that became a rousing success. I asked West for an interview recently where myself and Observer Sports columnist Bosmat Eynav could learn about the more recent Jerry West, the guy who is 77 years old (or young) now. He granted the request and suggested the Luxe Hotel on Sunset Blvd. Lakers forward Brandon Brandon Bass (knee) will play in Tuesday's preseason game against the Kings, Mark Medina of the Los Angeles Daily News reports. Bass was able to log a full practice session Monday, which apparently assuaged any concern the Los Angeles Lakers had regarding his left patella contusion. He'll likely serve as the top reserve big man off the bench Tuesday behind Julius Randle and Roy Hibbert, an arrangement that figures to hold during the regular season. Lakers guard Marcelo Marcelo Huertas (hamstring) will not be available for Tuesday's preseason game against the Kings. It's the fifth straight game Huertas will miss due to the strained right hamstring, but he seems to be nearing the end of his recovery timetable. Coach Byron Scott is optimistic that Huertas will resume practicing as soon as Wednesday, and gave the point guard a "75 percent chance" to play in the Los Angeles Lakers ' following exhibition game Saturday against Golden State, Mark Medina of the Los Angeles Daily News reports. Huertas is fighting for one of the last spots on the Lakers' opening-night roster. Perhaps Byron Scott is more progressive than people realize. The Lakers second-year coach, who has stated a distaste for relying too heavily on the 3-point shot, said Tuesday that he would like to see the NBA institute a 4-point line. The topic came up in a conversation hours before the Lakers exhibition game against the Sacramento Kings about what Scott would change if he were NBA commissioner. He also said he would go back to 1980s rules that allowed more physical play. But his willingness to add a 4-point shot was especially interesting, considering comments made last season that he did not believe 3-pointers win championships. However, he said Tuesday that he was not so old school that he wants to get rid of 3s, and took it a step further. Looking to gain some momentum with only 4 games left until the season opener the Lakers traveled to Las Vegas to take on an old rival in the Sacramento Kings. Coming off an impressive victory over Israeli team Maccabi Haifa, the Lakers looked to carry on that momentum against a more formidable foe. The Kings are led by DeMarcus Cousins, but he would sit out tonight’s game. The team still has some recognition, however, with forward Rudy Gay and newly-signed point guard Rajon Rondo. The Lakers were 1-3 coming into this game while the Kings were 3-1. 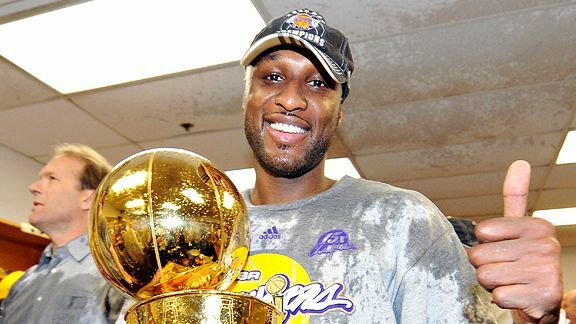 As reported just prior to preseason matchup with the Sacramento Kings, former Los Angeles Laker Lamar Odom is currently fighting for his life in a Las Vegas area hospital after being found “unresponsive” earlier. Addiction and substance abuse continue to be serious issues throughout society, so our thoughts and prayers remain with Odom and his family at this time. The Sacramento Kings said they rested All-Star center DeMarcus Cousins on Tuesday night so he could have a night off to rest. Sacramento did not need him much in a 107-100 victory at MGM Grand Garden Arena. The Lakers still conceded 38 points in the paint and double-digit efforts to Marco Belinelli (17 points), Darren Collison (16), James Anderson (13), Ben McLemore (11), Rajon Rondo (11), Rudy Gay (10) and Eric Moreland (10). The happiest Laker is the one whose father was addicted to heroin, whose mother died of colon cancer when he was 12, who attended three high schools, had his first college scholarship revoked before the fall semester of his freshman year, became a subject of three college investigations, declared for the NBA draft, tried unsuccessfully to pull out of the draft, was picked by arguably the worst franchise in sports, violated the league’s antidrug policy twice within eight months and after finally getting his life together, went home to New York City for an aunt’s funeral and wound up burying his 6 1/2-month-old son, then getting robbed at gunpoint.